I got interested in this field and industry back in high school in the 80’s. I had grown up a relatively inactive video gaming kind of kid but started cycling, swimming and doing martial arts and it sort of just grabbed me. That led me to UCLA to get a degree in physiology/kinesiology and it was there I became most interested in the science of training, diet, supplementation, etc. Essentially I was trying to get make myself a better athlete and was lucky to turn it into a career. I got on the Internet when it was basically starting in 1993 and have been around ever since. I’ve published 13 or 14 books on varying topics in that time. What are some of the main reasons why it is a mistake for females to train and diet the same way as males? Well let me qualify that question. In at least a general sense, women and men will be dieting similarly in terms of needing to set up an appropriate deficit combined with the proper training, etc. It’s more in the details of how that should be set up that will change. The size of the deficit, for example, women generally can’t handle the same magnitude of deficit, either in absolute (calories/day) or relative (percentage decrease from maintenance) terms. And that reason has to do with differences in how their systems will adapt or be affected by the deficit. For women, too large of a deficit (especially early on) can cause a rapid change in hormone levels with thyroid hormone dropping, cortisol going up, etc. Basically, their bodies adapt more quickly in this regards. Of greater concern is that a woman’s body will downregulate reproductive function to in a way that won’t be seen in a man. Their menstrual cycle can become negatively impacted, potentially leading to full blown amenorrhea (the loss of the menstrual cycle). And in the long-term this has the largest negative consequence which is that bone mineral density (BMD) can be lost with some indication that this loss may be permanent. Not only can this predispose women to more injuries such as stress fractures in the short-term but it may be putting them at greater risk for osteopenia/osteoporosis later in life. Men’s reproductive systems are relatively more robust, problems not starting without much larger deficits, or later in the diet and they start out with higher bone density to begin with, showing less loss overall. So they are relatively more protected by the problems that will plague women who try to follow the identical approach to their diet. 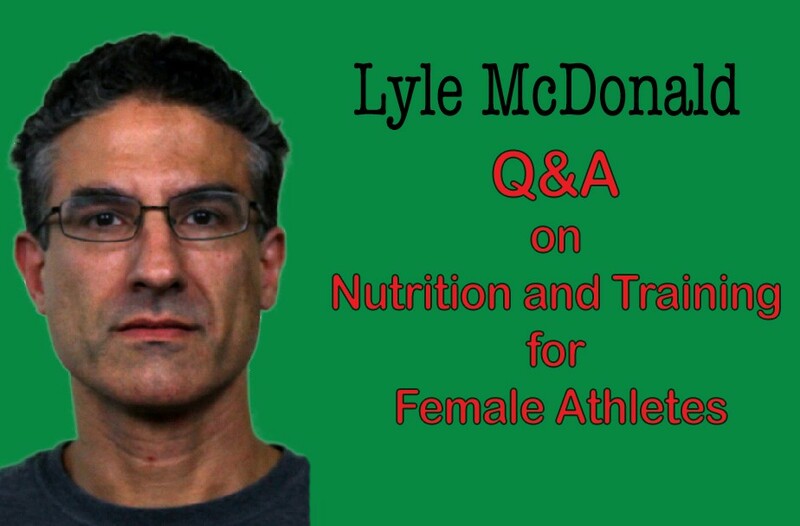 You have mentioned that at certain times during a female’s menstrual cycle their coordination is affected, which may impact on performance in the gym. How common is this and how much of an effect does it have? What are some strategies to put in place to account for this issue? This certainly can happen with the two most injury prone times appearing to be at ovulation (halfway through the cycle) and in the final week of the cycle (the late luteal phase, when PMS would typically occur). Women in certain sports seem to be at higher risk of ACL injuries around ovulation although this seems to be more due to changes in the ligament itself. The late luteal phase is really when the coordination issue can come to the forefront. As estrogen and progesterone drop at the end of the cycle (prior to menstruation) many women experience a large number of negatives including mood changes (including suicidal ideation at the extremes), low energy, often debilitating cramps and frequently a decrease in overall coordination. Some trainees may simply be unable to perform complex movements (and activities requiring high degrees of coordination such as jumping might carry an increased injury risk) at this time. That said, this is hugely individual as with so many aspects of the menstrual cycle. Some women notice almost nothing in the final week of the cycle while others may be almost unable to get out of bed. Any effect is probably mediated by estrogen, which has a staggering number of beneficial effects, especially in the brain. A woman who suffered coordination issues might consider supplementing with soy protein (25-30 grams total per day) or phytoestrogens (a total of 50-100 mg of diadzein and genestein) to see if it helps. Alternately, she might have to simply adjust her training to account for any changes during that week. Using less complicated exercises may be the only real solution, moving back to them after the beginning of menstruation when things usually return to normal. For a female looking to add muscle, what sort of guidelines do you have for amount of weight to gain per week? Go slow. Men don’t gain muscle rapidly to begin with and for women the process is even slower. In most studies, over 5-6 months of beginner training, a woman might achieve a 3-4 lb gain in muscle and few will get much more than 1 lb/month under all but the rarest circumstances (women who have elevated testosterone levels, frequently seen in Poly Cystic Ovary Syndrome or PCOS may gain slightly faster). If we *assume* roughly 3,500 calories to gain that pound of muscle, that’s a mere 110 calories over maintenance per day. Much more than that and all a woman will see is significant fat gain. What range do you suggest for protein intake for females in a calorie surplus? Does leanness factor into this? For both women and men I scale protein intake based on body fat percentage with those carrying more body fat needing less protein total. I also set it relative to lean body mass. One interesting bit is that women don’t require as much protein as men overall. This is hormonal with estrogen having an overall beneficial effect (trivia: if you give men estrogen, they use less protein for fuel during aerobic exercise and I have to wonder if one benefit of steroids while dieting is through this mechanism). For a relatively lean woman between 18-25% bodyfat, a protein intake of 1.2-1.4 g/lb LBM (2.6-3 g/kg LBM) would be an, admittedly high, recommendation and she might get away with less than that (the old 1 g/lb LBM) if her total calories and carbs are high enough. Of some interest, a recent study in ‘aspiring physique competitors’ (their phrase, not mine) found that 2.5 g/kg protein (they were using total bodyweight which would be higher relative to LBM) generated better muscle gain and fat loss compared to 0.9 g/kg. Admittedly this second value is far below what would usually be considered adequate and it might be that a middle value would have been just as effective. But this is a place where I would rather see slightly too much rather than slightly too little. In a gaining phase, women have enough calories to work with to fit in this much protein without running out of ‘room’ (calorie wise) for carbs and fats. For those looking to add muscle, do you recommend any form of nutrition periodisation? Is this any different to how you would do with males? With muscle gain it’s probably not quite as critical in terms as when dieting. As above, when a woman’s calories are higher, it’s usually less of a problem to get sufficient amounts of all the necessary nutrients on a daily basis. Fitting in sufficient protein, carbs and fats is generally achievable (this often is not the case when dieting). The major nutritional periodization going on here would be to insert the occasional short dieting phase as needed to offset any fat gain that is occurring. Even in the best of circumstances, keeping the surplus small, it’s tough to avoid all fat gain when gaining muscle. For women who either want to stay lean for personal or appearance reasons or need to keep their body fat at a reasonable level for when they need to diet down to a much lower level (i.e. a performance athlete during their competition period or a physique athlete for their show) a short diet every few ‘gaining’ cycles might be all that is needed to keep bodyfat in an appropriate range. Certainly, some of the currently in-vogue calorie cycling approaches could also be used in an attempt to offset fat gain during a gaining phase. Usually this will entail altering daily carbohydrate intake, perhaps putting a slightly larger surplus on training days with a small (5-10% below maintenance maximum) deficit on off-days. This becomes a problem when women are training 4-5 days/week and also has the potential to limit muscular gains since growth and adaptation are on-going. Cutting calories on the Tuesday after a hard Monday workout might not allow for optimal growth since adaptation is still occurring if that makes sense. What is an example of a generic long-term strategy you would use for a female who is relatively lean to start with and just wanting to improve their physique? Generic approach might be 2-3 8-12 week gaining phases where they start with 2-3 weeks of submaximal build up before trying to add weight while in a slight surplus. That might be followed by a short 4-6 weeks of moderate dieting with training pulled back to maintenance to lose any gained fat. Rinse and repeat. If a woman gained a large amount of fat more quickly, she might need to insert a dieting phase more frequently of course. 8) You have mentioned chronically elevated cortisol being an issue for people when dieting. Does this still occur when people are in a calorie surplus? Is it a barrier that might lead to excessive fat gain, rather than muscle gain? Certainly excessive training can still raise cortisol, even in a calorie excess. Perhaps as importantly certain personality types tend to have elevated cortisol to begin with. Extremely rigid dieters have been found to have cortisol levels 10% above normal and folks who are perfectionists or simply a bit neurotic about their training and diet often seem to have elevated cortisol. Overtraining will raise cortisol as well and, let’s face it, most people train too much for too long although I don’t know if this is specific to women more than men. But trying to train daily, being extremely rigid about your diet and obsessing about results all the time will tend to elevate cortisol. Sadly, that describes too much of the fitness industry. Does the level of insulin resistance somebody have effect how you would plan a diet? Yes. In general, people with insulin resistance do better with more moderated carb intakes and slightly higher fat intakes. Here I might be talking about 35-40% total carbs with fat up to 30-35% and the rest protein as this tends to keep blood sugar and hunger more stable and controlled. In some cases, lowering carbohydrates even further may be required but this is usually a good starting point overall. I’d note that, in research at least, insulin resistant people often do well with high-carb diets but only when everything they eat is very unrefined and high in fiber. You know, the foods that most people don’t eat in the real world. For a female in a calorie deficit, what kind of strategies do you use to reduce the rate that their metabolism slows down? You have said that cheat meals/days don’t have the impact they once were thought to have. Do you plan in longer phases of eating at maintenance or in a surplus? Well, single meals have never had any impact on metabolic rate and I’ve known that forever. The question was whether single days of high or higher calories had an impact and what it might have been. And the answer is maybe/it depends. There is unfortunately very limited research on this to date with some suggesting that 2 full days at maintenance can have at least a temporary reversal on the metabolic adaptations. Realistically it probably is taking longer than that to have a major effect and longer diet breaks (phases of 1-2 weeks at maintenance calories) are probably required to have much of an effect. Make no mistake, a woman dieting down to a certain level of leanness is going to face some degree of metabolic adaptation no matter what she does. All of these strategies are aimed at preventing problems as long as possible. Avoiding hormonal and menstrual cycle dysfunction, bone mineral density loss, these are critical issues, and arguably moreso for women and men and every strategy that can be used to even limit those changes is a good one.